Burnside Review, editor: Sid Miller. Volume 8, number 1.Portland, Oregon, 2012. $8. http://www.burnsidereview.org/ (Print and online). whatever is living is infinite. What really stands out about this issue is the diverse types of poems. Miller and his staff aren’t just focused on one style of poetry to the exclusivity of all others; Travis Mossotti’s “Dust” is a narrative poem about ecologists. Mark Seidl’s “Late January” is a confessional poem about a maudlin poem about loss and needing. There are love poems and loss poems, narrative, confessional, and surreal poems. It’s quite a range of work in such a small-sized journal. One caveat: BR does charge a small reading fee for submissions, but also pays contributors $50/poem. 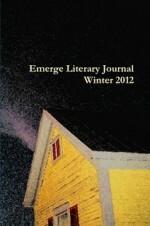 Emerge, as its name implies, purports to publish work by emerging writers (they also run reviews on their website). Looking through the table of contents, I can’t help but notice a poem by Howie Good, one of the most widely published but still largely unrecognized poets out there, so the journal must also want to give a helping hand to unrecognized writers as well. This issue was laid out in distinct sections with the work arranged by genre. It opens with “Our Father” a Christian religious poem by Leslie Aguilar. This isn’t a constant theme in the collection, but a couple of these religious poems pop up throughout. Jenny Burkholder’s “Eve Dreaming” is an evocative reimagining of the love story. Good’s poem, “Qwerty,” is a spring poem, practically a nature poem, which is a little surprising for Good, until you read it. “Whichever path I turn down,/there are birds & things,/the dubious signs of summer,” he says. “It’s a kind of moral statement,/so violent & so pointless.” Good concludes regarding this display of nature. because he loved her. Because he no longer loved her. hungry for the back of his head. The prose tends to be quite brief and ranges from flash to structurally inventive pieces, rarely more than two pages long. It begins with Joe Baumann’s “Mr. Slayter’s Grand Illusions,” a strange list story. Dan Crawley’s “Queen C” is a humorous story about competing children. There is the odd forgettable love-lost/bar story clunking up the issue, though there are standouts like Thomas Kearnes’ list-story “The Reasons I Won’t Come Back for You.” The most memorable stories are so because of their style more than their content. So what does that mean? Send them some good fiction! CL Bledsoe is the author of the young adult novel Sunlight; three poetry collections, _____(Want/Need), Anthem, and Leap Year; and a short story collection called Naming the Animals. A poetry chapbook, Goodbye to Noise, is available online at www.righthandpointing.com/bledsoe. Another, The Man Who Killed Himself in My Bathroom, is available at here. His story, “Leaving the Garden,” was selected as a Notable Story of 2008 for story South‘s Million Writer’s Award. His story “The Scream” was selected as a Notable Story of 2011. He’s been nominated for the Pushcart Prize 5 times. He blogs at Murder Your Darlings. Bledsoe has written reviews for The Hollins Critic, The Arkansas Review, American Book Review, Prick of the Spindle, The Pedestal Magazine, and elsewhere. Bledsoe lives with his wife and daughter in Maryland.